A bunch of cool tools to help the decentralized social network to grow. 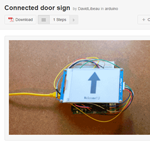 The goal of this project is to make a door sign (to say if people can enter or not) but connected to Wifi (and controlled via a webpage). [WIP] For the moment, the wifi connection does not work but I design the display and control it via a simple button. It uses a ePaper display to consume less energy and to display all the time the info. Personnal assistant ? Maybe. 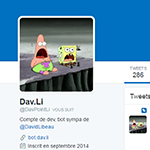 Cool Twitter bot ? Sure. The idea of this project was to discover NodeJs and the Twitter API. It was fun coding a chat bot during holidays! Wordpress site about the modular smartphone Project Ara.